Phosphorus is an essential element for all life forms. However, the ways it behaves in soils and shapes the ecosystem structure and functions are something of a mystery because of the difficulty analyzing phosphorus chemical composition. Mengqiang Zhu, an assistant professor in the University of Wyoming’s Department of Ecosystem Science and Management, hopes to shed some light on the subject through a $424,365 Faculty Early Career Development Program (CAREER) award he recently received from the National Science Foundation (NSF). Zhu received the funding for his project, titled “CAREER: Mineralogical and Biogeochemical Control of Phosphorus Transformation during Soil Development.” The grant began Aug. 15 and ends July 31, 2023. Funds not yet disbursed for fiscal years 2021 and 2022 will bring the grant total to $676,163. 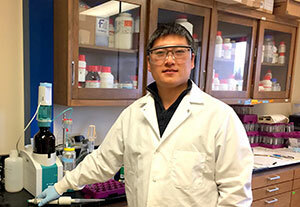 Zhu and his team will address the transformation of phosphorus chemical composition in soils and its coupling to the soil organic carbon cycle during long-term development of ecosystems using state-of-the-art spectroscopic techniques combined with field and laboratory studies. As part of the NSF CAREER award, Zhu will collaborate with researchers and educators in science education and teacher preparation programs at UW and local schools to develop and implement multicomponent outreach programs to broaden the educational impacts of scientific findings from the project. -- Develop a curriculum and a STEM (science, technology, engineering and mathematics) activity for students in grades 7-12 to understand microstructures of soils using 3-D projections. -- Train science teacher students to develop a field and laboratory curriculum on phosphorus availability in soils as part of the preparation program for earth science teaching in high schools. Erin Klauk, a Laramie High School earth science teacher; Megan Candelaria, WYSTEM education coordinator at UW; Andrea Burrows, a UW associate professor in the School of Teacher Education; and the UW Shell 3-D Visualization Center in the School of Energy Resources will be involved in the educational outreach component of the grant. The CAREER Program offers the NSF’s most prestigious awards in support of junior faculty who exemplify the role of teacher-scholars through outstanding research, excellent education and the integration of education and research within the context of the mission of their organizations. Such activities should build a firm foundation for a lifetime of leadership in integrating education and research. The Division of Earth Sciences within the NSF recommended Zhu for the award. Budgeted over five years, the grant funding will pay for materials and supplies, and foreign and domestic travel. It also will cover salaries for one postdoctoral researcher for three years and one Ph.D. student for four years. Zhu will hire a graduate student for the project. Zhu’s research team, called the Soil and Environmental Biogeochemistry Group, focuses on studying the biogeochemical and mineralogical processes that affect carbon and nutrient cycling and control mobility, bio-availability and toxicity of contaminants. Specific areas of interest include nutrient and carbon cycling in soils; formation, structure and properties of environmental materials; mineral-water interfacial reactions; and environmental remediation of soils, sediments and water contaminated by anthropogenic activities. A variety of synchrotron-based X-ray techniques, nuclear magnetic resonance spectroscopy and isotopic techniques are used to provide mechanistic understanding of these processes. Zhu teaches courses in soil chemistry, soils and environmental quality, and soil mineralogy. He received his Ph.D. from the University of Delaware; his master’s degree from the Chinese Academy of Sciences; and his bachelor’s degree from North China Electric Power University.